Gillette has just launched a recycling program with waste management company TerraCycle to collect all sorts of disposable razors, including cartridge units and the plastic packaging encasing razors. The Gillette Razor Recycling Program will let consumers send back recyclable razor material -- of any brand -- to the company. In addition, businesses, colleges and community organizations are being invited to set up drop-off spaces for the Gillette program. The company and TerraCycle will supply a recycling bin that can be folded close and sent back via UPS when it’s full. Organizations who participate can earn money or gifts for every 15 pounds of old razor material they send in, through TerraCycle’s Sponsored Waste Recycling Program. Every shipment that size earns points that can be used for charity gifts. The collected packaging will be recycled to become brand-new items like dog bowls, park benches, bike racks and more. Subscribers to the Gillette On Demand service can also use its functions to send back plastic material. “This is an important first step toward sustainable solutions for shaving products,” said Gillette CEO Gary Coombe. The company is also working on plans to extend the program to other countries “very soon,” he said. But Gillette is not discontinuing its own plastic disposable lines. 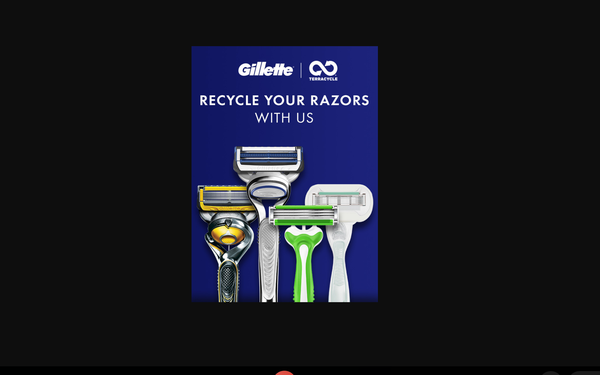 Gillette’s website extols the “use and toss” convenience of the throwaways. A spokeswoman said the company serves shavers at all price points and tries to “encourage” shavers to “trade up to our premium systems” which make up 80% of Gillette’s razor sales. According to the Environmental Protection Agency, Americans throw away 2 billion plastic razors every year, an awesome figure — but just a drop in the bucket compared to the total problem. For example, the EPA says every year, roughly 102.1 billion plastic bags are used and discarded by Americans. All told, 8.3 billion metric tons of plastic has been produced in the world so far, and 6.3 billion metric tons has become plastic waste, according to the journal Science Advances. Only 9% has been recycled. Gillette is a unit of Procter & Gamble, which like other major CPG companies, has recently gotten more serious about environmental issues. In January, for example, P&G partnered with Loop, an e-commerce program started by TerraCycle, to introduce “circular” recycling solutions. Via the Loop program, consumers can buy and then use aluminum containers over and over again, refilling them with major brands from participating companies like Pantene, Tide, Cascade and Oral-B.